How do chess grandmasters die? Remarkably, quite like the rest of us do — with some startling exceptions. Read on. On June 22, 1874, Howard Staunton (1810-1874) died of a heart attack (coincidently, on Morphy's birthday) at his home in London while working on his last chess book, Chess: Theory and Practice, which was published in 1876. His grave had been unmarked and neglected until 1997. Then, a memorial stone bearing an engraving of a chess knight was raised over his grave. On March 13, 1879, Adolf Anderssen died of a stroke in Breslau at age 60. His obituary ran 19 pages in the May, 1879 issue of "Deutsche Schachzeitung." He took part in 12 tournaments between 1851 and 1878 and won the first place prize in 7 of these events (London 1851, London 1862, Hamburg 1869, Barmen 1869, Baden 1870, Crefeld 1871, Leipzig 1876). He appeared on the prize list of all 12 tournaments he entered. Adolf Anderssen is buried at the Osobowicki Cemetery in Wroclaw, Poland. During World War II, his grave was damaged during bombing raids on Breslau (Wroclaw). The grave was then neglected by the Polish Communists because of Anderssen's German heritage. The Polish Chess Federation moved his grave to the Osobowicki Cemetery in 1957. On July 10, 1884 Paul Morphy died of a stroke while taking a cold bath. He was just 47 years old. He is buried at the Saint Louis Cemetery #1 in New Orleans. The tomb contains eight Morphy family members. On June 20, 1888, Johann Zukertort (1842-1888) died of a stroke while playing chess at Simpson's, a London coffee-house at the age of 45. While playing a chess game with Sylvain Meyer, Zukertort fainted. Instead of calling for medical help, he was taken to the British Chess Club in an unconscious state. They then took him to Charing Cross Hospital where they diagnosed the problem as a cerebral attack. He never regained consciousness, and died at 10 a.m. the next day. The cause of death was cerebral hemorrhage. At the time, Zukertort was also in the middle of a tournament at the British Chess Club and was in 1st place. He was scheduled to play a match with Blackburne on June 23, 1888 and Bird on June 26, 1888. He is buried at Brompton Cemetery in Kensington, England. His grave is A.F. 107 x 18. His grave was rededicated in 2012. On August 12, 1900 William Steinitz died of a heart attack in the Manhattan State Hospital at Ward's Island, New York at the age of 64. He is buried at the Cemetery of the Evergreens in Brooklyn, New York (Bethel Slope Section, Lot 5893). At 9:50 pm on January 25, 1908 (Jan 12, Old Style) Mikhail Chigorin died of diabetes in Lublin, Poland at the age of 57. Several years later, his body was moved to the Novodevichy Cemetery in St. Petersburg. At the end of 1934, Aron Nimzowitsch became ill and was bedridden for 3 months before dying of pneumonia (Hans Kmoch reported that it was cancer) in Copenhagen on March 16, 1935 at the age of 48. He is buried in Bispebjerg Kirkegaard (Cemetery) in Copenhagen. The gravestone simply says "Skakstormesteren Aron Nimzowitsch" (The Chess Grandmaster Aron Nimzowitsch), together witdh dates of birth and death. Included in Nimzowitsch's grave is that of Jens Enevoldsen (1907-1980), Denmark's first International Master. It is a 'double-grave.' On Jan 11, 1941, Emanuel Lasker died of a kidney infection. He was 72. He had been a charity patient at Mount Sinai hospital. About the same time, his sister died in a Nazi gas chamber. A condolence letter was sent to Martha Lasker by Albert Einstein, when Emanuel Lasker died. He is buried at Beth Olom Cemetery in Queens, New York. On March 8, 1942, Jose Capablanca (1888-1942), died after watching a skittles game at the Manhattan Chess Club. The cause of death was given as "a cerebral hemorrhage provoked by hypertension." He died at Mount Sinai Hospital, the same hospital that Emanuel Lasker died a year earlier. Capablanca's body was given a public funeral in Havana on March 15, 1942. He is buried at the Cristobal Colon Cemetery in Havana, Cuba. 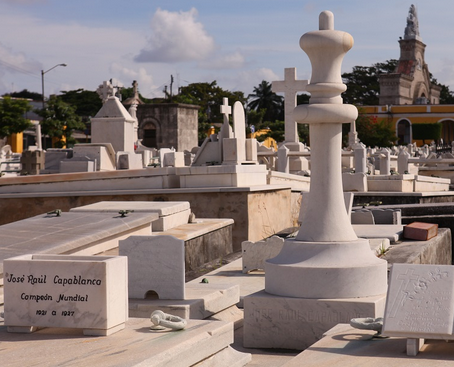 It is the only grave with a large chess king on top. On the evening of March 23 or early March 24, 1946 (a chambermaid found his body at 10:30 am on March 24) Alexander Alekhine died in his shabby hotel room (the Park Hotel) in Estoril, Portugal (just outside Lisbon) at the age of 53. He was dressed in an overcoat to keep warm and slumped back in a ratty armchair with a peg chess set on the table and his dinner dishes in front of him. Alekhine was first buried in Lisbon in 1946. In 1956, his ashes were transferred to the Montparnasse Cemetery in Paris (Section 8). Buried with Alekhine is his fourth wife, Grace. The grave was heavily damaged by a severe storm in 1999 (a tree fell on the grave) and was later restored in 2003. On May 29, 1951, GM (1950) Geza Maroczy (1870-1951) died in Budapest at the age of 81. On June 18, 1952, GM (1951) Efim Bogoljubov (1889-1952) died of a heart attack after concluding a simultaneous chess exhibition in Triberg, Germany. He was 63. On Feb 23, 1954, GM (1950) Jacques Mieses (1865-1954) died in London at the age of 88, just 4 days before his 89th birthday. On Feb 5, 1956, GM (1950) Savielly Tartakower (1887-1956) died in Paris at the age of 68, 18 days before his 69th birthday. On Jan 5, 1957, GM (1950) Oldrich Duras (1882-1957) died in Prague, Czechoslovakia at the age of 74. On Feb 9, 1961, GM (1950) Grigory Levenfish (1889-1961) died in Moscow at the age of 71. On March 15, 1961, GM (1950) Akiba Rubinstein (1882-1961) died in Antwerp, Belgium at the age of 80. On March 11, 1962, GM (1950) Viacheslav Ragozin (1908-1962) died in Moscow at the age of 53. On April 3, 1962, GM (1950) Ernst Gruenfeld (1893-1962) died in Ottakring, Vienna at the age of 68. He is buried at the Zentralfriedhof (Central Cemetery) in Vienna, Austria. It is one of the largest cemeteries in the world and the largest by number of interned in Europe (over 3.3 million bodies). On Oct 9, 1962, GM (1950) Milan Vidmar (1885-1962) died in Ljubljana, Yugoslavia at the age of 77. On Nov 30, 1962, GM (1950) Ossip Bernstein (1882-1962) died in his sleep at a sanatorium in the French Pyrenees at the age of 80. On July 25, 1963, GM (1954) Gosta Stoltz (1904-1963) died in Sweden at the age of 59. On Nov 11, 1963, GM (1950) Boris Kostic (1887-1963) died in Belgrade, Yugoslavia at the age of 76. On May 26, 1967, GM (1950) Gideon Stahlberg (1908-1967) died of a liver ailment in Leningrad at the age of 59. He had just participated in the drawing of lots at the 1967 Leningrad International when he became ill and died several days later. He is buried in Gothenberg, Sweden. On Sep 25, 1968, GM (1962) Vladimir Simagin (1919-1968) died of a heart attack while playing in a chess tournament in Kislovodsk, Russia, at the age of 49. On March 3, 1969, GM (1953) Alexander Tolush (1910-1969) died in Leningrad at the age of 58. On Oct 31, 1971, GM (1967) Alexander Zaitsev (1935-1971) died in the USSR of thrombosis as a consequence of a leg operation at the age of 36. On July 4, 1973, GM (1962) Leonid Stein (1934-1973) died of a heart attack in the Rossiya Hotel in Moscow at the age of 38. He was preparing to leave with the Soviet chess team for the European team championship, set for Bath, England, when he died. On June 5, 1975, GM (1950) Paul Keres (1916-1975) died of a heart attack in Helsinki, Finland, while returning home to Estonia from the World Class Championship in Vancouver, B.C. He had just won the event despite a doctor's orders not to play in the event due to the stress and his high blood pressure (he did not play in any tournament in 1974 due to health problems). His airplane had taken off from Helsinki to Tallinn when Keres had his heart attack. The aircraft turned around and landed back at Helsinki and Keres was rushed to the hospital and died. (I also played in that tournament and have one of the last photos of him, playing Walter Browne). Keres was buried at Metsakalmistu cemetery in Tallinn. On July 24, 1975, GM (1953) Nicolas Rossolimo (1910-1975) died in New York City at the age of 65. He died of head injuries following a fall down a flight of stairs in Greenwich Village. At the time, he had been giving chess lessons late at night in his studio.. He is buried in a Russian Orthodox cemetery in New Jersey. On Aug 16, 1975, GM (1950) Friedrich Saemisch (1896-1975) died in Berlin at the age of 78. On Feb 15, 1977, GM (1950) Isaac Boleslavsky (1919-1977) died in Minsk, USSR at the age of 57. He died after falling on an icy sidewalk, fracturing his hip and contracting a fatal infection while in the hospital. He is buried in Minsk a few yards away from his best friend and son-in-law, David Bronstein. On March 17, 1978, GM (1966) Semyon Furman (1920-1978) died of stomach cancer in Leningrad at the age of 57. On March 19, 1978, Honorary Emeritus GM (1977) Carlos Torre Repetto (1905-1978) died in Merida, Yucatan at the age of 73. On June 14, 1979, GM (1950) Igor Bondarevsky (1913-1979) died in Piatigorsk, USSR at the age of 66. On Oct 3, 1980, GM (1956) Alberic O'Kelly de Galway (1911-1980) died of leukemia in Brussels, Belgium at the age of 69. On Dec 8, 1980, GM (1953) Peter Trifunovic (1910-1980) died in Belgrade, Yugoslavia at the age of 70. On Jan 8, 1981, GM (1950) Alexander Kotov (1913-1981) died in Moscow at the age of 67. On Feb 14, 1981, Honorary Emeritus Grandmaster (1977) Esteban Canal (1896-1981) died in Varese, Italy at the age of 84. He is buried in Cocquio Trevisago, Italy. On Nov 24, 1991, GM (1952) Herman Pilnik (1914-1981) died in Caracas, Venezuela at the age of 67. On Nov 26, 1981, GM (1950) Max Euwe (1901-1981) died of a heart attack in Amsterdam at the age of 80. He was cremated on December 1, 1981 in Driehuis-Westerveld, the Netherlands. On July 18, 1983, GM (1950) Salo Flohr (1908-1983) died in Moscow at the age of 74. He is buried at the Vagankovo Cemetery in Moscow. On Sep 10, 1983, GM (1979) Victor Ciocaltea (1932-1983) died of cerebral apoplexy while playing his 4th round game at a chess tournament in Manresa, Spain at the age of 51. Ciocaltea became an International Master in 1957. He took him 22 years to become an International Grandmaster. On Dec 9, 1983, GM (1980) Janos Flesch (1933-1983) died in an automobile accident with his wife Ildiko Tenyel in Whitestable England at the age of 50. He was returning from the Kasparov-Korchnoi match in London to a tournament in Ramsgate when he became involved in a car accident. On Aug 8, 1984, GM (1952) Tigran Petrosian (1929-1984) died of stomach cancer in Moscow at the age of 55. He is buried in the Moscow Armenian Cemetery (Vagankovo Cemetery). On Sep 8, 1984, GM (1962) Mijo Udovcic (1920-1984) died in Yugoslavia at the age of 63. On Feb 20, 1985, GM (1954) Isaac Kashdan (1905-1985) died of a stroke at his home in West Los Angeles at the age of 79. On Feb 27, 1986, GM (1954) Gedeon Barcza (1911-1986) died in Budapest, Hungary at the age of 74. He is buried at the Kerespesi cemetery in Budapest. On May 28, 1986, GM (1977) Borislav Milic (1925-1986) died in Yugoslavia at the age of 60. On Aug 27, 1986, GM (1984) Georgy Agzamov (1954-1986) died at the age of 31. After finishing a chess tournament in Sevastopol in the Crimea, he was accidentally killed when he took a shortcut to go swimming, fell off a cliff between two rocks and became trapped. People around him heard his cries for help, but he was too deep down a cliff, and by the time rescue crews got to him, it was too late. He was the first Uzbekistand grandmaster. At one time he was ranked number 8 in the world, with a 2728 rating. He died a week away from his 32nd birthday. On Jan 13, 1987, Honorary Emeritus Grandmaster (1983) Vladimir Alatortsev (1909-1987) died in Moscow at the age of 77. On Nov 27, 1988, GM (1959) Jan-Hein Donner (1927-1988) died of a stroke at the Vreugdehof nursing home in Amsterdam at the age of 61. He is buried at Zorgvlied Cemetery in Amsterdam. On Dec 5, 1988, Honorary Emeritus GM (1983) Erik Ruben Lundin (1904-1988) died in Sweden at the age of 84. On Oct 15, 1989, GM (1974) Anatoly Lutikov (1933-1989) died in Tiraspol, Moldova at the age of 56. He committed suicide. On Jan 7, 1990, Honorary Emeritus GM (1984) Eero Book (1910-1990) died at the age of 79. On Oct 26, 1990, GM (1976) Guillermo Garcia Gonzales (1953-1990) died in a car wreck on his way to the airport to catch a plane to play in the Chess Olympiad in Novi Sad. He was only 36. On Jan 2, 1993, Honorary GM (1987) Vladimir Makogonov (1904-1993) died at the age of 88. On March 28, 1993, GM (1950) Reuben Fine (1914-1993) died of a stroke and pneumonia at St. Luke's-Roosevelt Medical Center in New York City. He was 78. He was survived by his wife Marcia. On May 20, 1993, GM (1965) Dragoljub Janosevic (1923-1993) died in Serbia at the age of 69. On May 13, 1994, GM (1964) Vladimir Antoshin (1929-1994) died in Moscow at the age of 64, one day before his 65th birthday. On November 13, 1994, Soviet grandmaster Igor Platonov (1934-1994), age 60, returned home to his apartment in Kiev after a chess tournament, when two thieves ambushed him and murdered him. The killers were never caught. On Jan 7, 1995, Honorary Emeritus GM (1985) Harry Golombek (1911-1995) died in Lambeth, London at the age of 83. On May 5, 1995, GM (1950) Mikhail Botvinnik (1911-1995) died of pancreatic cancer at his home in Moscow at the age of 83. On June 6, 1995, GM (1992) Heinz Lehmann (1921-1995) died in Germany at the age of 73. On June 30, 1995, Honorary Emeritus GM (1985) Mario Monticelli (1902-1995) died in Italy at the age of 93. On Aug 30, 1995, GM (1962) Lev Polugaevsky (1934-1995) died of a brain tumor in Paris at the age of 60. He is buried at the Montparnasse Cemetery in Paris. On Dec 29, 1996, GM (1965) Wolfgang Pietzssch (1930-1996) died in Leipzig at the age of 66. On Feb 2, 1997, GM (1952) Erich Eliskases (1913-1997) died in Cordoba, Austria at the age of 83. On July 4, 1997, GM (1950) Miguel Najdorf (1910-1997) died in Malaga, Spain at the age of 87. He is buried at the Cementerio de la Tablada in Buenos Aires. On Aug 8, 1998, GM (1950) Laszlo Szabo (1917-1998) died in Budapest at the age of 81. On Sep 11, 1998, GM (1960) Carlos Guimard (1913-1998) died in Buenos Aires at the age of 85. On Sep 24, 1998, GM (1976) Rosendo Balinas (1941-1998) died of liver cancer in Antipolo City, Philippines, at the age of 57. On Nov 17, 1998, GM (1952) Efim Geller (1925-1998) died at a hospital in Peredelkino, Russia at the age of 73. He died from complications due to prostate cancer and heart disease. He is buried at Peredelkino Cemetery in Moscow, Russia. On Jan 6, 2000, GM (1989) Alexei Vyzmanavin (1960-2000) died of a heart attack in Moscow at the age of 40. On Feb 5, 2000, Honorary Emeritus GM (1988) George Koltanowski (1903-2000) died of congestive heart failure in San Francisco at the age of 96. On March 5, 2000, GM (1964) Daniel Yanofsky (1925-2000) died in Winnipeg, Manitoba at the age of 74. On April 3, 2000, GM (1961) Miko Bobotsov (1931-2000) died of a stroke in Sofia, Bulgaria at the age of 68. He was Bulgaria's first chess grandmaster. On April 13, 2000, GM (1967) Aivars Gipslis (1937-2000) died of a stroke while playing chess in Berlin. He was playing for a local Berlin chess club when he collapsed from a stroke during the chess game. He died in a German hospital in Koepenick after being in a coma for several weeks. He was 63. On May 2, 2000, Honorary Emeritus GM (1986) Arthur Dake (1910-2000) died in his sleep in Reno, Nevada after a successful night of blackjack. He died 20 days after his 90th birthday. On July 2, 2000, GM (1963) Georgi Tringov (1937-2000) died in Bulgaria at the age of 63. On July 21, 2000, GM (1978) Vladimir Bagirov (1936-2000) died of a heart attack while playing a tournament chess game in Jyvaskla, Finland at the age of 63. He had started the Heart of Finland Open event with three straight wins to take the lead, and, following a time scramble, was in a winning position in round four against Teemu Laasanen, but suffered a heart attack, and died the next day. On Aug 6, 2000, GM (1982) Raul Sanguineti (1933-2000) died in Buenos Aires at the age of 67. On Sep 19, 2000, GM (1961) Karl Robatsch (1929-2000) died of throat and stomach cancer in Austria at the age of 70. On Mar 4, 2001, GM (1987) Gerardo Barbero (1961-2001) of Argentina died of cancer in Budapest, Hungary at the age of 39. On Sep 10, 2001, GM (1965) Alexei Suetin (1926-2001) died of a heart attack in Moscow at the age of 74. He had just returned home from the Russian Senior Chess Championship. On Nov 12, 2001, GM (1976) Tony Miles (1955-2001) died at his home in Harborne, Birmingham, from heart failure at the age of 46. He suffered from diabetes, which contributed to his death. On Feb 13, 2002, GM (1980) Edmar Mednis (1937-2002) died at Woodside, Queens, New York, of complications from pneumonia and a heart attack at the age of 64. On June 19, 2002, GM (1996) David Garcia Ilundain (1971-2002) died of a brain tumor in Spain at the age of 31. On Sep 23, 2002, GM (1967) Eduard Gufeld (1936-2002) died of a heart attack at Cedars-Sinai Medical Center in Los Angeles at the age of 66. He is interred in the Hollywood Forever Cemetery in Hollywood, California. On Feb 4, 2003, Hoorary GM (1985) Jaroaslav Sajtar (1921-2003) died in the Czech Republic at the age of 81. On March 6, 2003, Ludek Pachman died in Passau, Germany at the age of 78. On May 16, 2003, GM (1987) Bogdan Sliwa (1922-2003) died in Poland at the age of 81. On Aug 31, 2003, GM (1994) Peter Szekely (1955-2003) died of a heart attack in Hungary at the age of 48. On Oct 30, 2003, GM (1998) Aidyn Guseinov (1955-2003) died in Azerbaijan at the age of 46. On Nov 20, 2003, GM (1994) Valantin Mikhailovich Arbakov (1952-2003) died in Moscow at the age of 51. On Jan 2, 2005, Honorary Emeritus GM (1981) Arnold Denker (1914-2005) died of brain cancer in Fort Lauderdale, Florida at the age of 90. On Jan 3, 2005, GM (1976) Laszlo Vadasz (1948-2005) died in Hungary at the age of 56. On March 31, 2005, GM (1976) Milorad Knezevic (1936-2005) died in Serbia at the age of 68. On April 5, 2005, GM (1991) Dragoljub Minic (1937-2005) died of a heart attack on his 69th birthday in Novi Sad, Serbia. On April 22, 2005, GM (1965) Leonid Shamkovich (1923-2005) died of complications from Parkinson's disease and cancer in his Brooklyn home at the age of 81. On June 1, 2005, GM (1973) Vladimir Savon (1940-2005) died in Kharkiv, Ukraine at the age of 64. On Aug 28, 2005, GM (1999) Ruben Gunawan (1968-2005) died of heart failure and pneumonia in Manado, Indonesia at the age of 38. On Nov 12, 2005, GM (1978) Dragutin Sahovic (1940-2005) died in Belgrade, Serbia at the age of 65. On Nov 17, 2005, GM (2005) Igor Ivanov (1947-2005) died of cancer in St. George, Utah at the age of 58. Three weeks before his death, he took 1st place in the Utah Open. On Dec 15, 2005, Honorary Emeritus GM (1996) Enrico Paoli (1908-2005) died in Italy at the age of 97. On Feb 18, 2006, GM (1960) Ratmir Kholmov (1925-2006) died in Moscow at the age of 80. On April 20, 2006, GM (1954) Wolfgang Unzicker (1925-2006) died in Albufeira, Portugal, during a holiday trip, at the age of 80. On July 14, 2006, GM (1990) Aleksander Wojtkiewicz (1963-2006) died of a perforated intestine and massive bleeding in Baltimore, Maryland at the age of 43. A few weeks earlier, he tied for 1st at the World Open in Philadelphia. On July 23, 2006, Honorary Emeritus GM (1992) Rudolf Teschner (1922-2006) died in Berlin at the age of 84. On Dec 5, 2006, GM (1950) David Bronstein (1924-2006) died in Minsk, Belarus of complications from high blood pressure at the age of 82. He is buried at the Chizhovskoe Cemetery in Minsk, Belarus. On Jan 17, 2008, GM (1958) Robert Fischer (1943-2008) died from degenerative renal failure at the Landspitali Hospital in Reykjavik, Iceland at the age of 64. He had a blocked urinary tract and refused surgery or medications that would have prevented an early death. He is buried at a small Christian cemetery of Laugardaelir church, outside the town of Selfoss, Iceland, 30 miles from Reykjavik. On May 13, 2008, GM (1998) Valery Grechihin (1937-2008) died in Russia at the age of 70. On May 24, 2008, GM (1970) Bukhuti Gurgenidze (1933-2008) died in Tbilisi, Georgia at the age of 74. On June 9, 2008, GM (1997) Karen Asrian (1980-2008) died of a heart attack while driving in Yerevan, Armenia at the age of 28. On Aug 10, 2008, GM (2000) Igor Zakharevich (1963-2008) died in Russia at the age of 45. On Sep 25, 2008, GM (1975) Nino Kirov (1945-2008) died in Sofia, Bulgaria at the age of 63. On Nov 22, 2008, GM (1986) Theodor Ghitescu (1934-2008) died in Romania at the age of 74. On Dec 20, 2008, GM (1972) Albin Planinc (1944-2008), who suffered from mental illness, died in a mental institution in Ljubljana, Slovena at the age of 64. On Jan 17, 2009, GM (1999) Alexander Moroz (1961-2009) died in Ukraine at the age of 47. On Jan 23, 2009, GM (1960) Hector Rossetto (1922-2009) died in Buenos Aires at the age of 86. On Feb 17, 2009, GM (1994) Edhi Handoko (1960-2009) died of a heart attack at the Cibinong Hospital in Bogor, Indonesia at the age of 48. On April 27, 2009, GM (1955) Miroslav Filip (1928-2009) died in Prague at the age of 80. On May 19, 2009, GM (1980) Alexander Panchencko (1953-2009) died in Russia at the age of 55. On Sep 20, 2009, GM (1999) Shukhrat Safin (1970-2009) died of blood cancer (leukemia) in Samarkand, Uzbekistan at the age of 39. On Feb 19, 2010, GM (1974) Jesus Diez del Corral (1933-2010) died in Madrid at the age of 76. On March 20, 2010, GM (1962) Istvan Bilek (1932-2010) died in Hungary at the age of 77. On March 27, 2010, GM (1950) Vasily Smyslov (1921-2010) died of congestive heart failure in a Moscow hospital three days after his 89th birthday. He is buried at the Novodevichy Cemetery in Moscow, Russia. On March 31, 2010, GM (2004) Yuri Shabalov (1937-2010) died in Moscow at the age of 72. On May 8, 2010, GM (1950) Andor Lilienthal (1911-2110) died at his home in Budapest 3 days after he turned 99. He was the last surviving member of the 27 original grandmasters. On Sep 5, 2010, GM (1997) Janis Klovans (1935-2010) died in Latvia at the age of 75. On Sep 9, 2010, GM (1956) Bent Larsen (1935-2010), who suffered diabetes, died of a cerebral hemorrhage in Buenos Aires at the age of 75. On Nov 15, 2010, GM (1957) Larry Evans (1932-2010) died in Reno from complications following gallbladder surgery at the age of 78. He was survived by his wife Ingrid Evans, and two stepsons. On Feb 12, 2011, GM (1964) Mato Damjanovic (1927-2011) died in Zagreb, Croatia at the age of 83. On June 2, 2011, GM (1996) Leonid Yurtaev (1959-2011) died in Kyrgyzstan at the age of 52. On Sep 24, 2011, GM (1986) Konstantin Lerner (1950-2011) died in Herzlia, Israel at the age of 61. On Oct 2, 2011, Honorary GM (1990) Andrija Fuderer (1931-2011) died in Palamos, Catalonia at the age of 81. On Dec 4, 2011, GM (1975) Vitaly Tseshkovsky (1944-2011) died in Krasnodar, Russia at the age of 67. On Jan 13, 2012, GM (1993) Andrei Kharitonov (1959-2012) died in Russia at the age of 52. On March 21, 2012, GM (1976) Yuri Razuvayev (1945-2012) died in Moscow at the age of 66. On Aug 14, 2012, GM (1951) Svetozar Gligoric (1923-2012) died of a stroke in Belgrade, Serbia at the age of 89. He was buried in the Alley of the Greats at Belgrade's New Cemetery. When he died, he was the world's second oldest chess grandmaster. On Sep 14, 2012, GM (2008) Dmitry Chuprov (1978-2012) died of alcoholism in Kurgan, Russia at the age of 34. On Dec 29, 2012, GM (1999) Peter Dely (1923-2012) died in Hungary at the age of 78. 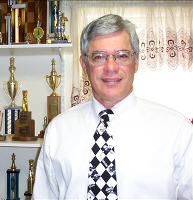 On Jan 19, 2013, GM (1992) Marcel Sisniega Campbell (1959-2013) died of a heart attack in Mexico at the age of 53. On Feb 14, 2013, GM (2004) Julian Radulski (1972-2013) died in Plovdiv, Bulgaria at the age of 40. On April 12, 2013, GM (1964) Robert Byrne (1928-2013) died at his home in Ossining, New York from Parkinson's disease at the age of 84. On May 18, 2013, GM (1959) Lothar Schmid (1928-2013) died in Bamberg, Germany at the age of 85. On Aug 8, 2013, GM (2003) Igor Kurnosov (1985-2013) died in Chelyabinsk, Russia at the age of 28. He was hit by a car as he was crossing the street in Chelyabinsk and died at the scene of the accident. He was killed on the spot at 2:45 am. He was one of the top 20 GMs in Russia, rated 2680 at his peak. On Oct 9, 2013, GM (1965) Milan Matulovic (1935-2013) died of Parkinson's Disease in Serbia at the age of 78. On Jan 11, 2014, GM (2002) Vugar Gashimov died in Heidleberg, Germany of a brain tumor at the age of 27. He was buried at the Alley of Honor in Baku, Azerbaijan. On Jan 25, 2014, GM (1974) Gyula Sax (1951-2014) died in Hungary at the age of 62. Om May 22, 2014, GM (1973) Dragoljub Velimirovic (1942-2014) died in Belgrade, Serbia 10 days after turning 72. On June 15, 2014, GM (1992) Andrei Kharlov (1968-2014) died in Kazan, Tatarstan, Russia at the age of 45. On Aug 17, 2014, GM (1965) Dragoljub Miladin Ciric (1935-2014) died in Serbia at the age of 78. On Aug 18, 2014, GM (1964) Levente Lengyel (1933-2014) died in Budapest, Hungary at the age of 81. On Oct 3, 2014, GM (2000) Zaw Win Lay (1963-2014) died in Mandalay, Myanmar at the age of 50. On Dec 8, 2014, Honorary GM (2003) Elmars Zemgalis (1923-2014) died in Seattle at the age of 91. On Jan 10, 2015, GM (1979) Slobodan Martinovic (1945-2015) died in Serbia at the age of 69. On Jan 23, 2015, GM (1997) Alexander Lastin (1976-2015) died in Zheleznovodsk, Russia at the age of 38. On Feb 6, 2015, GM (2000) Oleg Chernikov (1936-2015) died in Russia at the age of 78. In 2000, he won the World Senior Chess Championship and became a grandmaster at the age of 63. On June 24, 2015, GM (1970) Walter Browne (1949-2015) died in his sleep in Las Vegas at the age of 66. He was staying at the home of Ron Gross when he died. He had just finished playing in the 50th National Open where he tied for 9th-15th. He then played a 25-board simultaneous exhibition. On Oct 23, 2015, GM (1976) Krunoslav Hulak (1951-2015) died in Zagreb, Croatia at the age of 64. On Dec 25, 2015, GM (1993) Leonid Gofshtein (1953-2015) died in Israel at the age of 62. On Jan 12, 2016, GM (2011) Ivan Bukavshin (1995-2016) died at a chess training camp in Tolyatti, Russia at the age of 20. He died of a massive overdoes of No-Spa (an antispasmodic drug). Bukavshin became U-12 European chess champion in 2006, U-14 European Youth Champion in 2008 and U16 European champion in 2010. He took 3rd place in the 2015 Aeroflot Open in Moscow. On April 7, 2016, GM (1967) Laszlo Barczay (1936-2016) died in Budapest, Hungary at the age of 80. On April 27, 2016, GM (1984) Viktor Gavrikov (1957-2016) died in a hospital in Burgas, Bulgaria at the age of 58. On May 17, 2016, GM (2004) Dragan Paunovic (1961-2016) died in Serbia of a heart attack at the age of 54. On May 26, 2016, GM (1962) Arturo Pomar Salamanca (1931-2016) died in Barcelona at the age of 84. On June 6, 2016, GM (1956) Viktor Korchnoi (1931-2016) died in Wohlen, Switzerland at the age of 85. On June 6, 2016, GM (1978) Herman Suradiradja (1947-2016) died in Indonesia at the age of 68. On Nov 26, 2016, GM (2013) Yuri Eliseev (1996-2016) died in Moscow at the age of 20. He died after falling from a balcony on the 12th floor of his Moscow apartment, apparently while undertaking the extreme sport of parkour. He was trying to reach the balcony of a neighboring apartment. In 2012, he was the world under-16 chess champion.